For some reasons you might need to split a huge image into multiple image files such as for easy printing, fast uploading into websites, fast sending via email, etc. MapSplitter, a free and open source utility offers you a quick and easy way to do so. MapSplitter is a tiny Java based utility designed for only a single purpose which is to split a large jpeg image file into multiple images with only a few clicks. It is not an image editing tool but allows users to split an image file. This tiny application works on any operating system which supports Java and it can be downloaded via the link here. The file is about 376kb in size. Once the download is completed, users can double click the executable file, mapsplitter_fat.jar, to start the splitting process. 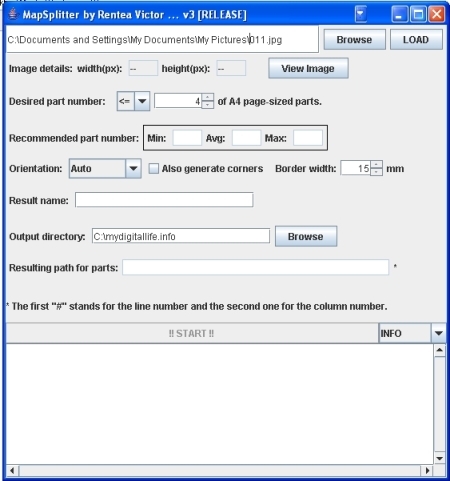 Users can decide how many parts they want the program to split the jpeg file.